Vejer de la Frontera day by day: : Vejer de la Frontera - Moorish town? Vejer de la Frontera - Moorish town? When I see a blog or a promotional film describing Vejer as an ‘old Moorish town’ I’m fascinated by the romantic appeal of this idea. In fact, though, it isn’t that simple. The site of Vejer has been occupied for more than three thousand years by Tartessians, Turdetanians, Romans, Visigoths, Moors and Christians. 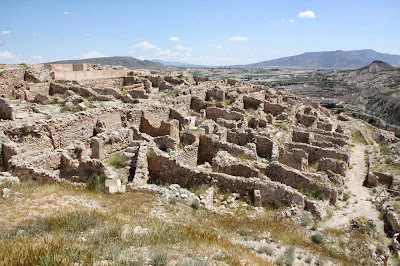 We might just as well call it a Roman or a Visigothic town as a Moorish one. Moroccan and Andalucián cultures were always closely intermingled. Both were occupied by the Romans, who left behind a rich shared heritage. At a time when land transport was difficult, the sea connected the two regions, rather than dividing them. Even before the occupation in 711, Moorish leaders had established alliances with Visigothic Andalucians, who helped them to overthrow Spain. Abd ar-Rahman (731-788), the emir of Cordoba and the greatest ruler of al-Andalus, was three parts Spanish, white-skinned and blue-eyed. And the great Spanish liberator, Guzmán el Bueno (1256-1309), was a Moorish merchant, sponsored by the King of Fez. The ‘Moors’ occupied and ruled Andalucía from 712 to 1492 in total, though in Vejer they were expelled in 1264. There’s a lot of confusion about what ‘Moorish’ really means. The term is used to describe the style of the Berber-Islamic residents of North Africa before and during the Middle Ages, people we now call ‘Moroccan' or ‘Algerian'. The Islamic occupation of Spain began in 711, with the Battle of La Janda, and as far as Vejer was concerned, ended with the recapture of the town in 1264, though the Islamic occupation did not finally end until the defeat of the Kingdom of Granada in 1492. Islamic society was more advanced than its European counterparts and Cordoba became the most sophisticated city in Europe. Its library contained 40,000 books compared with the 2000 or so to be found in most European libraries. Traditional Islamic towns grew up around the medina (market) and the main mosque. Their design was irregular and reflected social structures and religious concerns. Moorish streets were narrow, giving shade and a communal life. Children playing outside always had adult supervision. Moorish building reflected a concern for privacy and the separation of the sexes. Each house contained a public area near the main entrance, where the men could meet and entertain, and a private area, the ‘harem’, where the women worked on household tasks, remaining out of sight. Though none of the Moorish houses remain, it seems likely that the current shape of Vejer evolved during the Islamic era. The walls were probably established during this period, though the Romans had also created fortifications. The Castle and the main place of religious worship would have been located in the same places as they are today, and there would have been a thriving market somewhere between the two. However, today's streets are wider than they would have been in the Islamic era and the central market has disappeared, taking with it much of the atmosphere of the old Moorish town. In 1264, Vejer was retaken by Christian forces and an era of conflict began. Finally, the Muslims were obliged to leave for Morocco or the kingdom of Granada. Some remained in the surrounding hills as guerrillas or attacked from the seaward side, later becoming known as the Barbary corsairs. A few changed their faith and integrated with the Christian population, but these were in the minority. After the defeat of the Islamic occupants, something akin to ethnic cleansing took place. Previously Moorish towns were scoured of all traces of their Islamic occupants, and there now remains very little evidence of their presence. Vejer was stripped of all Moorish influence, and we now have more physical evidence of the Tartessian period, two thousand years before the Moors, than we do of the Islamic period. Defending the new frontier was a tough job and the border towns acquired the suffix 'de la Frontera' in recognition of their function in keeping the Moors at bay. For a while after its recapture, Vejer was used as a military garrison. Fifty years or so later, the area was repopulated by incomers from northern Spain. The displaced Moslems, who after all, had occupied Andalucia for longer than Europeans have occupied the American continent, were understandably disgruntled and some pursued jihad by sea, making life a misery for all the coastal towns of Spain and elsewhere in Southern Europe. Regarding the physical heritage of bricks and mortar, Moorish buildings were made of soft materials and nothing remains from the Moorish era except the inner horseshoe gate at the castle. That doesn't mean that the building materials disappeared, because the stone was reused for new buildings. Nowadays, Vejer is a typical Andalucían town which has little in common with its Moroccan counterpart except for those features which can be found in most little hillside towns traditional all over Europe. Narrow streets, steps, quaint passages and jumbled together cottages exist in many different villages which could not conceivably be described as 'Moorish'. Another feature of the Mudéjar style is the use of unplastered brick. However, Vejer's houses are typically lime-washed, a feature which deflects the sun and allows the walls to 'breathe'. This feature was first noted by the Romans. The 'White Towns' have been white for more than two thousand years. Traditional Moors, still with a nomad's tent somewhere at the back of their minds, built houses with few or no external windows onto the street. This insulated the house and stopped heat from entering. Cooling breezes were allowed in through low openings or small doors and rose upward through the patio, an effective technique for thermal control in a hot climate. Andalucían houses, however, traditionally have long windows, almost down to floor level. As Gerald Brenan told us in 'South of Granada', this made courtship possible for many generations of protected Spanish youth. In the story 'Cardenio', originating with Cervantes' Don Quixote and retold by Shakespeare, the heroine, Luscinda, is deflowered through the iron 'reza' which defended her window. 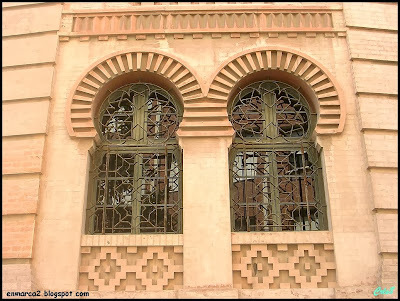 One of the most distinctive features of Arabic and north African building is the predominance of flat-roofed houses. The roofs were used for drying food for storage, and in the warm southern evenings, for meeting and even sleeping. Now in Vejer, we see many flat-roofed houses, often scrambling down the hill in true Moorish style. Actually, though, flat roofs are not a traditional style in this part of Spain. We get quite a lot of rain in the spring and autumn, and pitched roofs were traditionally used to allow run-off and additionally to collect water for storage in the underground cisterns, the aljibes. 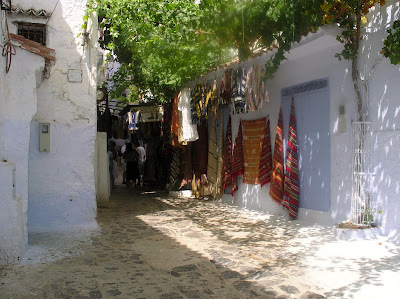 Sometime in the twentieth century, people started demolishing their roofs to make more living space for drying washing and other utilities, and this practice has been widely imitated by modern builders, giving Vejer a more Moroccan look than it would ever have had in the past. It is now prohibited to destroy traditional pitched roofs in the old part of town. Despite these differences, however, Vejer does enjoy some resemblances with the buildings of the Islamic era. One of the most distinctive aspects of Mudejár architecture, probably inspired by the Romans, is its use of decorative tiles. This tradition has continued in Andalucía, where most houses have tiles on the walls and/or floors. Indoor patios, also Roman in origin, were widely used in both cultures until the post-war building boom introduced apartment blocks, with their balconies and terraces. To sum up, the ‘Moorish’ character of Vejer is only indirectly related to the Islamic era. For centuries, most Andalucians violently disliked the ‘Moros’, and this attitude has not entirely disappeared today. In 1773, an earthquake destroyed half the town, seeping away the last remnants of the middle ages. Vejer is really an eighteenth-century village, and though some of its buildings are considerably older, none date back as far as the Islamic occupation. In northern Europe, however, as industrialisation turned everyone’s lives a bit greyer, the Romantic movement was born. We began to look towards Lord Byron's ‘mysterious East’ for a more colourful view of life and one of the results was the Moorish revival in architecture, expressed in such disparate buildings as the Gran Teatro Falla in Cadiz and the now-defunct Alhambra cinema in London, as well as many others. As travellers like Amelia Edwads and Freya Stark began to write about their middle eastern adventures, and Washington Irving published his 'Tales of the Alhambra', Americans and Europeans began a love affair with the image of Moorish culture, a concept which has only a passing connection with the modern culture of Andalucía. Vejer is a perfect Andalucían town, with its roots in many different and often contradictory cultures. It doesn't need a borrowed 'moorish' identity to make it the beautiful and fascinating place it is today. The kitchen, in and out. The writings on the walls.